From left to right: Friðrik Theodorsson or Frikki T. on trombone. Next to me, Jón Möller on piano. He was one of first guys I played with at the age of 17. Me, then Hans Jensson tenor sax. Hans was in the original Elvar Berg Band from the 60's. With music, you just get better with time! 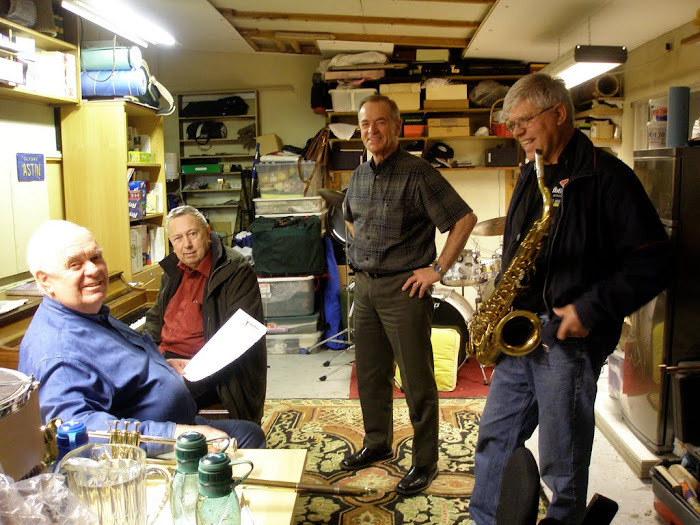 Famous in the story of Icelandic jazz is when the Austrian piano master Friedrick Gulda came to Reykjavik, played Beethoven with the symphony then wound up at a jam session where Gunnar Ormslev, Jón Páll, Bjössi Bassi and others played with the American drummer Gene Stone. Gulda hadn’t thought about sitting down at the piano but after listening to Gene play with the others could not resist and got into it. This was such a memorable, rare event in European jazz that it’s still talked about. Now 37 years later Stone is again in Reykjavik and drove one of the most enjoyable jam sessions ever heard on our ”Frozen Rock”. It must be fun for a base player to have a swinging “driver” at the drums and bassist Þorgrímur Jónsson was inspired. Great bass tones took advantage of the packed Duckling and his solo’s were short, well build, spiced. Jón Páll played the guitar like he did 37 years ago but better and more mature. He touched every nerve in “Round Midnight” and his solo in “I Hear A Rhapsody” was packed with energy. Sigurður Flosason (alto sax), Ólafur Jónsson (tenor sax) and Óskar Guðjónsson (soprano and tenor sax), had great moments and it was pure pleasure to listen to them in “Lover Man” which critics agree that this take and a recording back in 1976 featuring Ormslev, Rúnar Georgs(tenor sax) and Jón Páll are truly the most memorable moments in Icelandic jazz. Ellington’s exiting “Caravan” and “Tizolsvar” the end numbers were up tempo and Stone played his solo reminiscent of Buddy Rich and the horns along with Jón Páll spiced their solos with eastern influence in the style of old Hollywood movies. A very enjoyable and artistic performance. Excellent. I know no success with song nor intstrument - yet, I think I know this feeling. There's something about 'laying down track' that is more than just playing (or saying). Good on Dad and his boys! Keep it up, lads!